An altar server is a lay assistant to a member of the clergy during a Christian liturgy. An altar server attends to supporting tasks at the altar such as fetching and carrying, ringing the altar bell, among other things. A young male altar server is commonly called an altar boy, whereas a young female altar server is commonly called an altar girl. While the function of altar server is commonly associated with children, it can be and is carried out by people of any age or dignity. "Mass should not be celebrated without a minister, or at least one of the faithful, except for a just and reasonable cause." As in other churches, altar servers are sometimes called acolytes in the Latin Church. Pope Benedict XVI spoke of Saint Tarcisius as "presumably an acolyte, that is, an altar server". However, within the Latin Church, the term "acolyte" is also used in a more restricted sense, often specified as "instituted acolyte", to mean an adult man who has received the instituted ministry of that name. Acolytes in this narrower sense are not necessarily preparing for ordination as deacons and priests. They are authorized to carry out some functions, in particular that of cleansing the Eucharistic vessels, that are not entrusted to ordinary servers. Those who are to be ordained to the diaconate must be instituted as acolytes at least six months previously. This ministry was long classified in the Latin Church as a minor order, as by the Council of Trent. The General Instruction of the Roman Missal, which does not use the term "server" and instead speaks of altar servers generically among "other ministers", treats in detail of the functions of the "acolyte", often specifying "instituted acolyte". The 1983 Code of Canon Law altered the juridical situation: without distinguishing between male and female, it declared: "Lay persons can fulfill the function of lector in liturgical actions by temporary designation. All lay persons can also perform the functions of commentator or cantor, or other functions, according to the norm of law." On 30 June 1992, the Pontifical Council for the Interpretation of Legislative Texts issued an authentic interpretation of that canon declaring that service of the altar is one the "other functions" open to lay persons in general, without distinguishing between male and female. In reference to this authentic interpretation, the Congregation for Divine Worship and the Discipline of the Sacraments sent on 15 March 1994 a circular letter to presidents of episcopal conferences, clarifying that the canon in question is only of permissive character. It does not require the use of female altar servers. It is thus for each diocesan bishop to decide whether to allow them in his diocese.. A later document, from 2001, states that, even if a bishop permits female altar servers, the priest in charge of a church in that diocese is not obliged to recruit them, since nobody, male or female, has a right to become an altar server. The document also states that "it will always be very appropriate to follow the noble tradition of having boys serve at the altar". As priests in charge of churches are not obliged to avail of a diocesan bishop's permission in this matter, those belonging to traditionalist Catholic groups such as the FSSP and the Institute of Christ the King and some other priests do not. In the absence of instituted acolytes, some of their functions at Mass may be carried out by altar servers. Servers hold liturgical books for the priest when he is not at the altar and is proclaiming the presidential prayers with outstretched hands. They bring and hold such things as books, thuribles, the lavabo water and towel, vessels to hold the consecrated bread, and microphones. Entrance: The entrance procession is led by a thurifer with burning incense (if incense is used at the Mass) and a cross-bearer carrying a processional cross, who is flanked on either side by another server bearing a lighted candle. Proclamation of the Gospel: If incense is used, a server presents to the priest at the Alleluia or other pre-Gospel chant the thurible and the incense that he puts in the thurible and blesses, and servers, who may carry the thurible and lighted candles, precede to the ambo the deacon or priest who there proclaims the Gospel. Preparation of the Gifts: One or more servers assist in arranging on the altar the corporal, the purificator(s), the chalice(s), the pall(s), and the Missal, leaving it to the deacon to take care of the sacred vessels. (At a concelebrated Mass without participation by a deacon, a concelebrating priest carries out the functions assigned to the deacon.) If, as is appropriate, the bread and wine for the Mass are presented by the faithful, servers assist the priest or deacon who receives these and perhaps other gifts and carry the bread and wine to the priest, placing other gifts in a place distinct from the altar. They present the cruets of wine and water for the priest or deacon to pour some into the chalice. If incense is used, a server presents the thurible and incense to the priest, who incenses the offerings, the cross and the altar, after which the deacon or a server incenses the priest and the people. When the priest then washes his hands standing at the side of the altar, a server pours the water over them. Consecration: An altar server rings a bell shortly before the consecration, generally at the epiclesis (when the priest extends his hands above the gifts). In accordance with local custom, a server also rings the bell when, after the consecrations of the bread and wine, the priest shows the Host and then the Chalice. If incense is used, a server incenses the consecrated host and the chalice while these are being shown to the people. Sign of Peace: The priest or deacon may give the sign of peace to servers, while remaining within the sanctuary. Distribution of Holy Communion: In some places it is customary for servers to assist at the distribution of Holy Communion by holding a communion-plate for communicants. Whether it is to be held by communicants or by a server, a communion-plate is placed on the credence table before Mass. Its use (held by the communicants) is prescribed when Holy Communion is given by intinction. Recessional: The servers lead the priest and any other clergy as at the entrance procession, except that a server who acted as thurifer at the entrance now follows the cross-bearer. If a bishop celebrates Mass solemnly, two servers, wearing vimpas, hold the mitre and the crosier, and present them at the appropriate times. The vestment common to all ordained and instituted ministers of whatever rank is an alb, which is to be tied at the waist with a cincture unless the alb is made to fit without cincture. Acolytes, readers and other lay ministers (such as altar servers) may wear either an alb or other appropriate attire as determined by the local episcopal conference. All who wear an alb should use a cincture and an amice, unless the form of the alb makes these unnecessary. Servers often wear cassock and surplice, with black and red being the most common colors for a server's cassock. Ukrainian Catholic bishop and priests during the Divine Liturgy, with altar servers in front (note the crossed oraria the servers are wearing). In the Byzantine Rite, altar servers assist the higher clergy during services. They might carry the cross, candles or liturgical fans in processions and entrances; maintain the censer, ensuring it has enough live charcoal, loading it with incense and handing it to the priest or deacon when required; preparing the hot water (zeon) in time for it to be added to the chalice at the Divine Liturgy; prepare the antidoron for the people to receive after Holy Communion; and any other necessary tasks so that the priest need not be distracted during the service. An altar server is vested in the sticharion only. In the early Church, before someone could be a server he had to be tonsured. 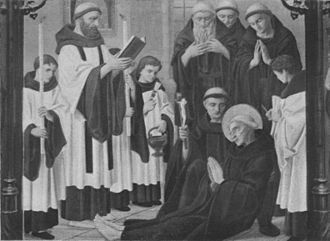 Nowadays, in many places it is not necessary to be tonsured before one is allowed to serve (since the tonsure must be done by a bishop or higher-ranking priest). The rites of "Setting Aside a Taper-bearer" and "Tonsuring a Reader" have now been combined into one service. It is the custom in some traditions, such as the Greek Orthodox or Melkite Catholic, to allow tonsured altar servers to also vest in the orarion, worn crossed over the back like that of a subdeacon but with the ends hanging parallel in front. 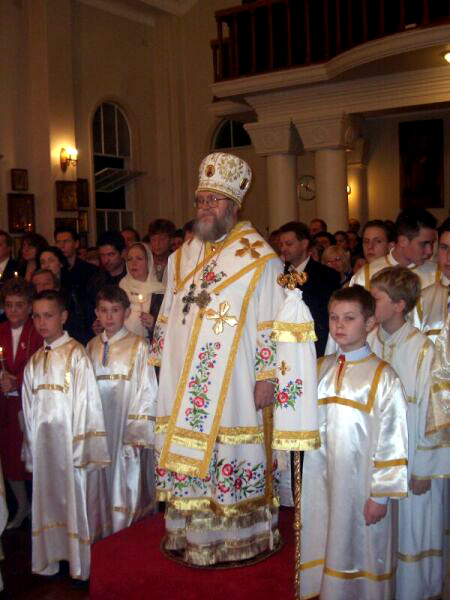 Among the Russians, however, the orarion is not usually worn by servers, but only by duly ordained subdeacons and deacons, with the exception that laymen who are blessed to perform some of the functions of subdeacons may sometimes be blessed to wear the orar. Before vesting, the server must fold his sticharion and bring it to the priest for him to bless. 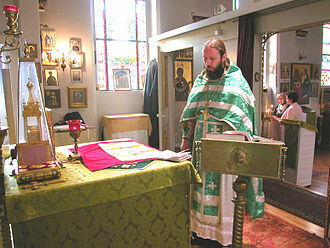 The priest blesses and lays his hand on the folded sticharion. The server kisses the priest's hand and the Cross on the vestment, and then withdraws to vest. Any server who has not been tonsured must remove the sticharion when he receives Holy Communion, because communicants receive the Mysteries according to their order within the Church (so tonsured clergy vest while laymen remove their vestments). Before divesting at the end of the service, the server must receive the priest's blessing. The minimum age varies by local circumstance, but boys must be mature enough to carry out their duties without disrupting the sanctity of the altar. Although it is common in North America for boys to act as altar servers, in some places this practice is virtually unknown and these duties are always carried out by adult men. In other places where altar servers are normally boys, adult men will not vest if called upon to serve. In yet other places, boys are not permitted to serve in the Altar on reaching their teens on the grounds that the young man is no longer innocent enough to serve in the altar. Altar servers, regardless of age, are subject to all the normal restrictions for those not of higher clerical position. Anyone who is bleeding, or has an open sore, is not permitted to enter the altar. They may not touch the altar table or anything on it under any circumstances, nor the prothesis without a blessing. 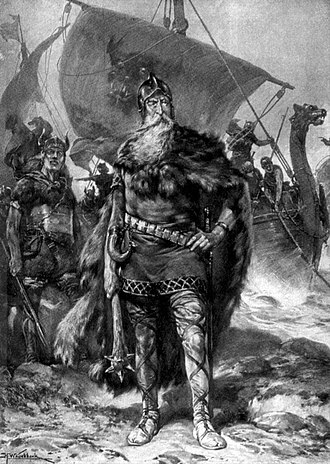 They may not touch the sacred vessels, the chalice and diskos (paten) at any time. They may not stand directly in front of the altar table or pass between the front of it and the iconostasis, but must cross between the altar and the High Place if they need to move to the opposite side. 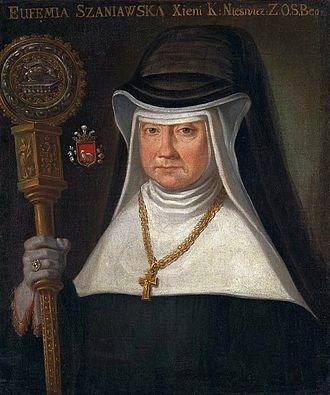 In general, women do not serve in the altar except in women's monasteries. In that case they do not receive the clerical tonsure (though they must be tonsured nuns), and do not vest in the sticharion, but wear their normal religious habit for attending services, and serve at a certain distance from the actual altar table. Normally, only older nuns may serve in the altar; but the Hegumenia (Abbess) is permitted to enter even if she is younger. A few parishes have begun to use women as altar servers. In many Anglican churches, and Lutheran churches, all who serve in the above positions are called acolytes. 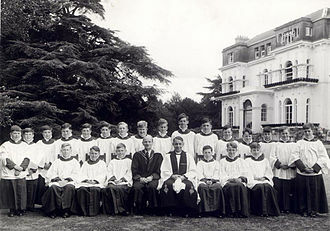 In Anglo-Catholic and some Episcopal Churches however, the vast majority of roles associated with an altar server are the same as those in the Catholic Church, and the same titles for each individual role are retained from Catholic tradition – mostly restored during the Oxford Movement in the 19th century. ^ Leonard of Port Maurice (1970). The Hidden Treasure: Holy Mass. TAN Books. ISBN 9781618905314. ^ General Instruction of the Roman Missal, 254; cf. Code of Canon Law, canon 906. ^ Laughlin, Corinna; Riley, Kenneth A.; Turner, Paul (2014). Guide for Extraordinary Ministers of Holy Communion. LiturgyTrainingPublications. p. 57. ISBN 9781616711283. ^ "The Catholic Liturgical Library". ^ "General Instruction of the Roman Missal, no. 100" (PDF). liturgyoffice.org.uk. ^ "Catholic Bishops' Conference of England & Wales, Celebrating the Mass: A Pastoral Introduction (Catholic Truth Society 2005), p. 19" (PDF). liturgyoffice.org.uk. ^ General Instruction of the Roman Missal makes no reference to a separate incensing of concelebrants (cf. Edward McNamara, "Incensing the Congregation"). ^ "Altar Boy Handbook of Holy Trinity Catholic Church, Gainesville, Virginia (2009), p. 16" (PDF). Retrieved 2018-07-14. ^ Edward McNamara "Colors of Cassocks and Altar Cloths"
^ "Acolyte". Episcopal Church. 22 May 2012. Retrieved 28 October 2017. 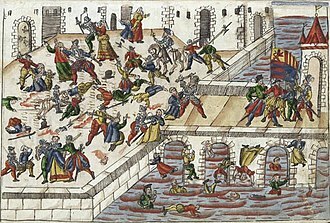 ^ "Acolytes and deacons". augustanadc.org. Retrieved 28 October 2017. Wikimedia Commons has media related to Altar servers. In the Latin Rite of the Catholic Church, in Lutheranism, in Methodism, and in the Anglican Communion, an altar or sanctus bell is typically a small hand-held bell or set of bells. The primary reason for the use of bell is to create a joyful noise to the Lord as a way to give thanks for the miracle taking place atop the Altar of Sacrifice. An ancillary function of the bell is to focus the attention of those attending the Mass that an event is taking place on the altar. A little before the Consecration, when appropriate, a server rings a bell as a signal to the faithful, according to local custom, the server rings the bell as the priest shows the host and the chalice. They prescribed a triple ringing of the bell at each showing of the consecrated elements, on 10 September 1898, the Congregation of Sacred Rites declared inappropriate the use of a gong instead of the altar bell. The ringing of an altar bell began probably in the thirteenth century and it is not mentioned in the original 1570 Roman Missal of Pope Pius V and was not introduced into papal Masses until the time of Pope John Paul II. Like all church bells, the bell is not rung from the end of the Gloria in excelsis at the Mass of the Lords Supper until the beginning of the Gloria in excelsis at the Easter Vigil. During this interval a clapper is sometimes used in place of the altar bell, in branches of Lutheranism, altar bells are rung at the two appropriate times during the Words of Institution to signify the real presence. Anglican parishes use the bell, which is rung to signify the Real Presence of Christ in the sacred Elements. During the Eucharist, it is rung three times - once before the Words of Institution, and once at each elevation of the Host. It may be rung to indicate the time that the faithful may come forward to receive Communion, the bells are rung when the monstrance or ciborium is exposed or processed, for example when moving the reserved Sacrament from a side altar to the high altar. Custom differs concerning its use at Low Mass, or during Lent, in some Methodist churches, particularly the United Methodist Church of the United States, altar bells are used two different times during common services held on Sundays. The evolution of the ministry of altar servers has a long history. In the early Church, many ministries were held by men and women, by the early Middle Ages, some of these ministries were formalized under the term minor orders and used as steps to priestly ordination. One of the orders was the office of acolyte. We too have forbidden this practice in the words in Our oft-repeated constitution Etsi Pastoralis. The references to the Greeks pertains to the Orthodox practice of ordaining women as deacons, with the practice of private Masses, scandal was an additional reason not to have a woman or girl alone with a priest. However, it has been customary in convents of women for nuns to perform the ministry of acolyte without being formally professed in that minor order, around the time of the Second Vatican Council, some dioceses without authorization allowed girls in the lay ministry of altar servers. For example, this started as early as 1965 in Germany. 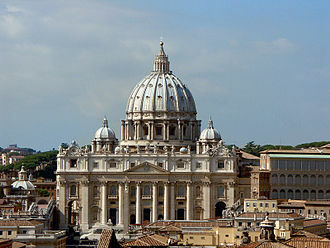 The Vatican sought to put an end to such experimentation with the 1970 instruction Liturgicae instaurationes, the practice nonetheless continued in some places, and the Vatican reaffirmed the prohibition against female altar servers in the 1980 instruction Inaestimabile donum. A thurible is a metal censer suspended from chains, in which incense is burned during worship services. In Roman Catholic and Anglican churches, the altar server who carries the thurible is called the thurifer, the practice is rooted in the earlier traditions of Judaism in the time of the Second Jewish Temple. Beyond its ecclesiastical use, the thurible is employed in other spiritual or ceremonial traditions, including some Gnostic Churches, Freemasonry. Thuribles are sometimes employed in the practice of ceremonial magic, the workings of a thurible are quite simple. Each thurible consists of a section, chains, a metal ring around the chains. Many thuribles are supplied with a stand, allowing the thurible to be hung safely when still hot and this may be done several times during the service as the incense burns quite quickly. Once the incense has been placed on the charcoal the thurible is closed and used for censing. A famous thurible is the huge Botafumeiro in Santiago de Compostela Cathedral, Spain The word thurible comes from the Old French thurible, the Latin thuribulum is further formed from the root thus, meaning incense. Thus is an alteration of the Greek word θύος, which is derived from θύειν to sacrifice, due to the ceremonial use of incense, its cultural importance in western catholicism can be seen e. g. in the introduction of a incense smelling fragrance Avignon in 2002. Avignon was created for Comme des Garçons as a part of their incense series by Bertrand Duchaufour, two double swings and images of the Saints exposed for public veneration. A series of swings, the altar. Presenting the thurible to the priest or deacon when they need to use it Incensing the priest after the priest has incensed the offering at Mass. Another server, previously called a boy and now more commonly a boat bearer. These rules, except for the manner of incensing the offerings at Mass and they direct that incensing of the altar be done with single swings at 29 designated points of an altar attached to the rear wall of the sanctuary, and at 22 points of a freestanding altar. Pre-1969 editions of the Roman Missal did not allow the use of incense at Low Mass, in accordance with the conditions laid down in the document Summorum Pontificum of 2007, use of the 1962 edition as an extraordinary form of the Roman Rite is permitted. The word Alleluia or Hallelujah, which literally means Praise ye Yah, a short form of Praise Yahweh and often rendered as praise the Lord. The form Alleluia is used to refer to a chant in which that word is combined with verses of Scripture. This chant is used before the proclamation of the Gospel. The Hebrew word Halleluya as an expression of praise to God was preserved, untranslated, by the Early Christians as an expression of thanksgiving, joy. Thus it appears in the ancient Greek Liturgy of St. James, on the other hand, the word Alleluia is excluded from the Roman liturgy during Lent and, in earlier forms of the Roman Rite, during Septuagesima. In those earlier forms, the word was excluded in Masses for the Dead. In those periods, the word was replaced, in particular after the Gloria Patri at the beginning of each Hour of Divine Office, by the phrase Laus tibi, Domine, in the Ordinary Form 1969 Missale Romanum of the Roman Rite, the word is simply omitted. In traditional Gregorian chant, this responsorial chant opens with the cantor singing Alleluia, after which the choir repeats it, the cantor sings the main part of the verse, and the choir joins in on the final line. At the end of the chant, the opening Alleluia is repeated, when a Sequence follows the Alleluia, this final repeat is omitted, as it was in other cases in the Middle Ages. The musical style of a plainchant Alleluia is generally ornate, the Alleluia for Christmas Eve, for instance, has an ambitus of only a perfect fifth, but this example is rather extreme. Alleluias were frequently troped, both with added music and text and it is believed that some early Sequences derived from syllabic text being added to the jubilus, and may be named after the opening words of the Alleluia verse. Alleluias were among the frequently used chants to create early organa. The verse or verses can be given in the Lectionary for Mass. In that form of the Roman Rite, if singing is not used, the Gradual, when sung, is replaced with an Alleluia chant during Eastertide, thus putting not one but two such chants before the Gospel reading. In the Eastern Orthodox and Greek-Catholic Churches, after reading the Apostle at the Divine Liturgy, the response of the choir is always the same, alleluia, alleluia. An acolyte is an assistant or follower assisting the celebrant in a religious service or procession. In many Christian denominations, an acolyte is anyone who performs duties such as lighting altar candles. In others, the term is used for one who has been inducted into a particular liturgical ministry, the word acolyte is derived from the Greek word ἀκόλουθος, meaning an attendant, via Late Latin acolythus. In the Eastern Orthodox Church and Eastern Catholic Churches, the nearest equivalent of acolyte is the altar server, at one time there was a rank of minor clergy called the taper-bearer responsible for bearing lights during processions and liturgical entrances. However, this rank has long ago been subsumed by that of the reader, the functions of an acolyte or taper-bearer are therefore carried out by readers, subdeacons, or by non-tonsured men or boys who are sometimes called acolytes informally. Also, the term altar-boys is often used to refer to young altar servers, subdeacons wear their normal vestments consisting of the sticharion and crossed orarion and servers traditionally wear the sticharion alone. In recent times, however, in many of the North American Greek Orthodox Churches, for the sake of uniformity, readers do not cross the orarion while wearing it, the uncrossed orarion being intended to slightly distinguish a reader from a subdeacon. In the Russian tradition, readers wear only the sticharion, if a server has not been tonsured, he must remove the sticharion before he can receive Holy Communion. In the early church, a taper-bearer was not permitted to enter the sanctuary, however, servers are permitted to go in, but they are not permitted either to touch the Holy Table or the Table of Oblation. Until 1972, the acolyte was the holder of the highest of four minor orders, by Pope Paul VIs motu proprio Ministeria quaedam of 15 August 1972, the term minor orders has been replaced by that of ministries. Two such ministries, those of reader and acolyte, are to be throughout the Latin Church. A prescribed interval, as decided by the Holy See and the episcopal conference, is to be observed between receiving them. 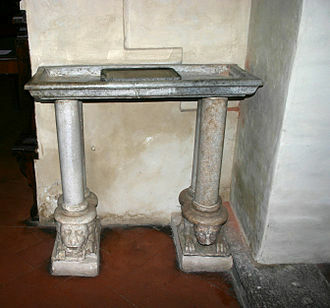 A credence table is a small side table in the sanctuary of a Christian church which is used in the celebration of the Eucharist. The credence table is placed near the wall on the epistle side of the sanctuary. The wafers for the communion of the faithful may be stored in a ciborium, the wine and water for the chalice will be in cruets. The chalice, and paten, covered with their cloths and veil may be placed on the credence from the beginning of the service until the Offertory, at which time they are moved to the altar. In the traditional Roman Catholic Mass, the chalice, and paten, covered with their cloths, during the Offertory, the acolyte, deacon or priest places the sacred vessels on the altar. The wine and water are taken in their cruets to the altar to be poured into the chalice, after the altar has been incensed, two servers wash the priests hands. The priest will hold his hands over the bowl and the first server will pour water over the priests hands. During the washing, the priest says the words of Psalm 25, when a bishop is serving, a larger and more ornate basin and ewer are used to wash his hands. 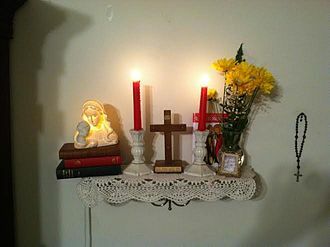 After Communion, when the priest or deacon consume the remaining elements in the chalice they are rinsed out and wiped, replaced on the credence table, traditionally, at Low Mass, the credence was not used, but a niche in the wall was used instead. During Novus Ordo masses the ritual is less elaborate. In the Eucharist of the Anglican Communion the ritual regarding the use of the table varies from parish to parish. In some parishes, the ritual is quite elaborate, with an army of servers, in other parishes the chalice and paten may already be on the altar from the beginning of the service. Normally the server will bring the wine and wafers to the priest at the offertory, the term credence table is not normally found in use within the Eastern Orthodox Church. All of the items for the celebration of the Divine Liturgy are normally placed on the Table of Oblation. There is, however, a table on which other items, such as the lists containing the names of the faithful living and departed whom the priest will commemorate. Mid-1900s three-tiered bell at Our Lady of Manaoag. Two clergy swing thuribles towards the congregation during the funeral of Joachim Meisner, Cologne Cathedral, 2017. Mediaeval lavabo in the right-hand transept of Saint Mark's Church in Milan. Patriarch Kirill I of Moscow washing his hands at the Great Entrance during an outdoor Divine Liturgy. Ottonian processional crucifix, 10th century Essen cathedral. Russian Orthodox Crucession with lantern, processional cross and banners. Cardinal Tarcisio Bertone wearing a tropical white cassock trimmed in cardinalatial scarlet in Santo Domingo, Dominican Republic. A cruet designed to serve vinegar at the table. Pair of silver cruets from the Warsaw's Cathedral with letters A and V by Michael Mair, 1695-1700, Museum of the Warsaw Archdiocese. 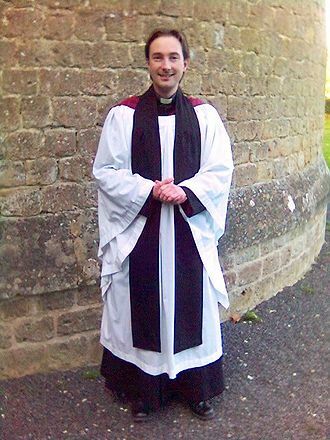 The vimpae may be seen here, though out of use, as the Anglican Bishop shown is wearing his mitre and holding his crozier. 'Pockets' may clearly be seen in the vimpae, for the servers to insert their hands when holding the pontificalia.